Fairmont Hotels & Resorts is a chain of luxury hotels headquartered in Toronto, Ontario. It was established in 2001 following the merger of Canadian Pacific Hotels and Resorts (founded in the late 1880s) and Fairmont Hotels (founded in 1907). Fairmont operates 75 properties in 24 countries, with a strong presence in Canada and the United States. The hotel chain is owned by AccorHotels, which acquired FRHI Hotels & Resorts in 2016. Mount Stephen House in 1887. Opened a year earlier, it was one of the first hotels operated by Canadian Pacific Hotels. Canadian Pacific Hotels (CP Hotels) was originally a division of the Canadian Pacific Railway (CPR) Hotels department. The division operated a series of hotels along their rail lines as early as 1886. Many of these resort hotels were originally built and operated by the railway's hotel department, while a few were later acquired from Canadian National Hotels, a hotel division of the Canadian National Railway. Over the years, a collection of grand railway hotels was put together throughout Canada, both rural and urban. By the 1980s, CP Hotels' collection included the Chateau Lake Louise, the Banff Springs Hotel, the Château Frontenac, the Empress Hotel, the Palliser Hotel, the Fairmont Royal York, and others. In addition to its properties in Canada, the hotel chain operated a small number of hotels outside Canada, with properties in Germany, Israel, Mexico, and the United States. 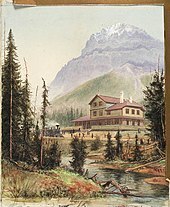 CPR's rival Grand Trunk Railway and later Canadian National Railway copied Van Horne's approach by building hotels such as the Jasper Park Lodge in Jasper, Alberta, and the Château Laurier in Ottawa. CPR purchased Canadian National Hotels, Canadian National Railway's hotel division in 1988, making CP Hotels the nation's largest hotel owner. In the 1990s, CP Hotels began to expand and purchased the Canadian Delta Hotels chain and the international Princess Hotels chain in 1998, which became wholly owned subsidiaries of CP Hotels. In 1999, the CP Hotels purchased the San Francisco-based Fairmont Hotels and Resorts chain. During the 1890s, James Graham Fair bought the land where the Fairmont San Francisco now stands, the first hotel to bear the Fairmont namesake. The nearly completed structure survived the earthquake of 1906. Although heavily damaged by the subsequent fires, the hotel was renovated under the eye of architect Julia Morgan and finally opened in 1907. In 1926, the Penthouse Suite was created with three secret passageways to access it. The Fairmont Copley Plaza Hotel is one of seven properties managed by Fairmont prior to being acquired by Canadian Pacific Hotels. In 1945, the Fairmont San Francisco was acquired by Benjamin Swig. Beginning in the 1960s, the Swig family developed Fairmont into a small chain of luxury hotels throughout the United States. Operating as Fairmont Hotels Management, the hotel chain acquired, and built a number of hotel properties. The chain acquired the Roosevelt Hotel in New Orleans in 1965, initially renaming it the Fairmont Roosevelt, and then Fairmont New Orleans. The Fairmont San Jose was opened by the hotel chain in 1987. The company assumed management of the Plaza Hotel in New York in 1995 and purchased the Copley Plaza Hotel in 1996, renaming it The Fairmont Copley Plaza Hotel. By 1998, the company managed seven properties in the United States. In addition to those properties, the company also operated the Colony Square Hotel in Atlanta as Fairmont Colony Square Hotel from its opening in 1974 to 1977, and The Bellevue-Stratford Hotel in Philadelphia as Fairmont Philadelphia from 1979 to 1980. In April 1999, Canadian Pacific Hotels, Kingdom Hotels International and Maritz Wolff & Co. bought Fairmont Hotels Management L.P., with Canadian Pacific Hotels holding the majority of the shares (67%). In 2001, Canadian Pacific Limited, the parent company of both Canadian Pacific Hotels and Resorts, and Canadian Pacific Railway, was reorganized. During this reorganization, Canadian Pacific Hotels and Resorts was renamed to Fairmont Hotels and Resorts, borrowing the name of Fairmont Hotels, the company it had purchased in 1999. The newly re-organized Fairmont company shuffled several properties to its Delta Hotels subsidiary, while retaining its other "signature" resorts and hotels from its former CP Hotel and Fairmont properties under the new Fairmont banner. Later that year in October 2001, Canadian Pacific Limited spun off all of its subsidiary companies into separately traded "independent" companies, including the Canadian Pacific Railway and Fairmont Hotels and Resorts. Companies like Fairmont Hotel and Resorts, and the Canadian Pacific Railway were split into smaller companies in a 2001 "starburst" move designed to increase the valuations of its individual divisions. In the early 2000s, Fairmont multiplied its openings in the United States. In 2001, Fairmont introduced the Willow Stream Spa prototype, a $7 million 2-floor 8,000-square-foot spa located inside the Fairmont Empress Hotel. The signature spa brand was then implemented in many of Fairmont’s locations. In July 2001, Fairmont Hotels signed a joint-venture with Sheikh Khalifa bin Zayed Al Nahyan for a minority-stake purchase and the management of a luxury 393-room hotel in Dubai. The Fairmont Dubai property was the first Fairmont branded hotels in the Middle East. In 2003, Fairmont introduced Fairmont Heritage Place, a chain of timeshare hotels, with the first opening in Mexico. In 2004, Fairmont Hotels & Resorts Inc. paid $70 million to take full control of the management company that runs its properties. Then in early 2006, a cluster of Fairmont Hotels & Resorts was sold for $3.9 billion USD to Colony Capital, LLC. As a result of that purchase, Fairmont Hotels & Resorts was united with Raffles Hotels and Resorts and Swissôtel to form Fairmont Raffles Hotels International (FRHI), though the four chains still operate under their individual names. In 2010, the company opened the Makkah Royal Clock Tower, A Fairmont Hotel. The hotel located within the Abraj Al-Bait skyscraper complex. In April 2010, Kingdom Hotels sold 22% of its shares of FRHI (from 58% to 35%) to Qatari Diar Real Estate Investment, giving them 40% of FRHI and became the second largest shareholder of the company. The remaining 60% belonged to a private shares holding in Sweden, trusted in ACCOR hotels, and other investors. The Middle East became Fairmont’s new target market, where Fairmont opened in the Makkah Royal Clock Tower Hotel in 2010 and at the Palm Jumeirah in 2012. In Asia, Fairmont reopened the Peace Hotel in Shanghai in 2010, opened in Baku’s Flame Towers in 2011, and opened its first hotel in India in 2012. In the USA, Fairmont acquired the Claremont Hotel in Berkeley, California in 2014. In 2015, AccorHotels, with the approval and support of the external party, announced the acquisition of Fairmont Raffles Hotels International (FRHI), thus adding Raffles, Fairmont and Swissôtel to its Luxury Hotel Brands portfolio, whilst still only holding 40% of the company. Acquiring Fairmont Hotels enabled the French hotel group to gain access to the North American market. In 2015, Fairmont stated it would invest in two new hotels in Egypt, in addition to its existing Fairmont hotel located in Cairo. In 2017, Fairmont opened the Qasar Istanbul, its first hotel in Turkey. ^ a b The company was formed in 2001, following the merger of Canadian Pacific Hotels and Fairmont Hotels. ^ Avalos, George (15 December 2017). "Downtown San Jose's Fairmont Hotel to be sold for $250 million". The Mercury News. Digital First Media. Retrieved 8 October 2018. ^ "Trump Sells Majority Stake in Plaza Hotel". Los Angeles Times. Los Angeles Times Communications LLC. 12 April 1995. Retrieved 8 October 2018. ^ "Looking Beyond Our Borders" (PDF). Canadian Pacific Hotels & Resorts Inc. 1998 Annual Report. Canadian Pacific Ltd. 1999. p. 3. Retrieved 8 October 2018. ^ Green, Josh (23 June 2016). "After 50 years, is Colony Square finally ready to grow up?". Atlanta. Retrieved 6 October 2018. ^ "CP Hotels buys stake in U.S. hotel manager". CBC News. Canadian Broadcasting Corporation. 19 April 1999. Retrieved 12 September 2018. ^ "CP hotels take Fairmont name". The Globe and Mail. The Globe and Mail Inc. 9 December 2000. Retrieved 12 September 2018. ^ Jang, Brent. "CP spinoff destined to put Fairmont on the map". The Globe and Mail. The Globe and Mail Inc. Retrieved 12 September 2001. ^ "Fairmont Hotels & Resorts". Forbes.com. 5 May 2004. Retrieved 2 October 2017. ^ Jeremy Ferguson (31 May 2003). "Willow stream spa, Victoria". Theglobeandmail.com. Retrieved 2 October 2017. ^ "Fairmont Acquires Minority Stake in 393-room Luxury Business Hotel Project in Dubai; Will Manage the Hotel Upon Completion". Hotel-online.com. 16 June 2001. Retrieved 2 October 2017. ^ "Fairmont Heritage Place". Fairmont.com. 2017. Retrieved 1 October 2017. ^ "Saudi Prince, Colony Capital Buy Fairmont Hotels for $3.9B". Foxnews.com. 30 January 2006. Retrieved 2 October 2017. ^ "Kingdom Holding Sells Stake in Raffles". dealbook.nytimes.com. Retrieved 20 September 2012. ^ Elizabeth Broomhall (18 December 2011). "Fairmont to hire near 3,000 staff for new hotels". arabianbusiness.com. Retrieved 2 October 2017. ^ Ed Attwood (2 May 2011). "Fairmont Raffles eyes new hotels in Saudi Arabia, Qatar". Arabianbusiness.com. Retrieved 2 October 2017. ^ Bindu Suresh Rai (29 July 2010). "Fairmont to open 20 Hotels in Mideast, Asia". Emirates247.com. Retrieved 2 October 2017. ^ Malcolm Moore (28 July 2010). "Peace Hotel reopens on Shanghai's Bund". Telegraph.co.uk. Retrieved 2 October 2017. ^ "Fairmont Baku Opens in Azerbaijan's Flame Towers". Lodgingmagawine.com. 1 July 2013. Retrieved 2 October 2017. ^ "Fairmont Opens First Hotel in India". Fodors.com. 20 August 2012. Retrieved 2 October 2017. ^ Frances Dinkelspiel (25 March 2014). "Fairmont group and Richard Blum buy Claremont Hotel". Berkeleyside.com. Retrieved 2 October 2017. ^ "French hotel chain Accor buys Fairmont, Raffles and Swissotel for $2.9B US". Cbc.ca. 9 December 2015. Retrieved 1 October 2017. ^ Yeoh Siew Hoo (28 July 2017). "Accor's Issenberg talks Fairmont, culture and content". Webintravel.com. Retrieved 1 October 2017. ^ "New Swissotel, Raffles and Fairmont Hotels Planned for Egypt". TravelPulse. ^ "Experience Egypt and the treasures of the Nile". Tripsmiths Limited. ^ Niels Stolte (26 April 2017). "Fairmont Quasar Istanbul Opens in Turkey". Gtspirit.com. Retrieved 1 October 2017. Wikimedia Commons has media related to Fairmont Hotels and Resorts.